With less than a month before the project is scheduled to be complete, the finish crews have moved to the 1964 addition. 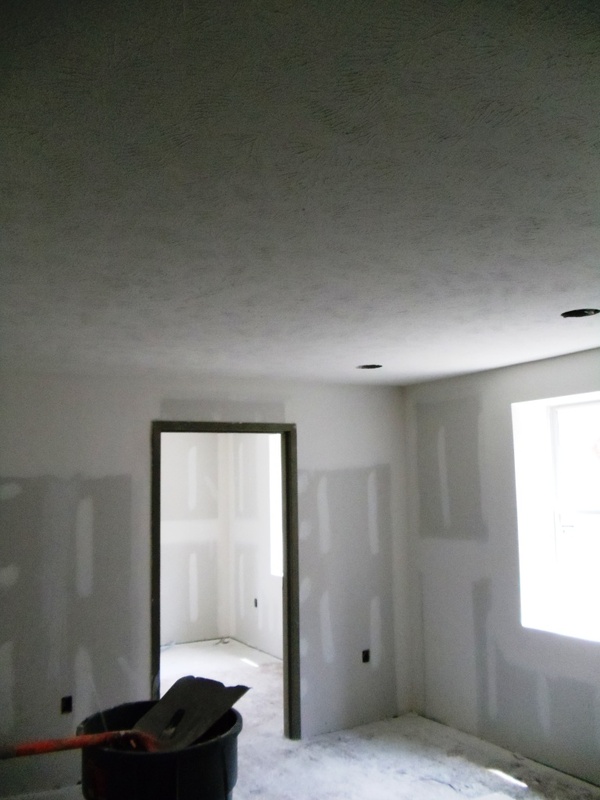 Drywall has been hung, ceilings are up and bathrooms are ready for tile. It will be a very busy month to meet the August 15 deadline. 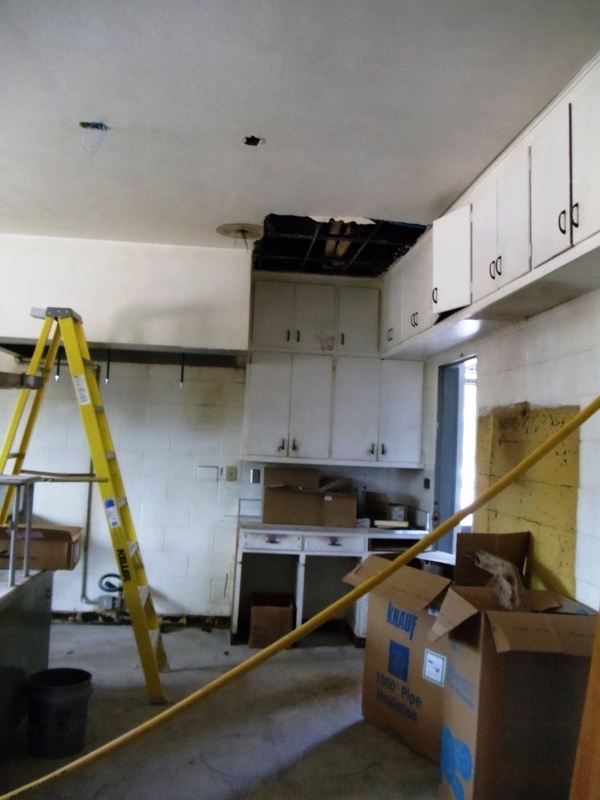 Final finishes are in progress in the 1931 building – light fixtures, switches, plugs and plumbing fixtures are being installed. 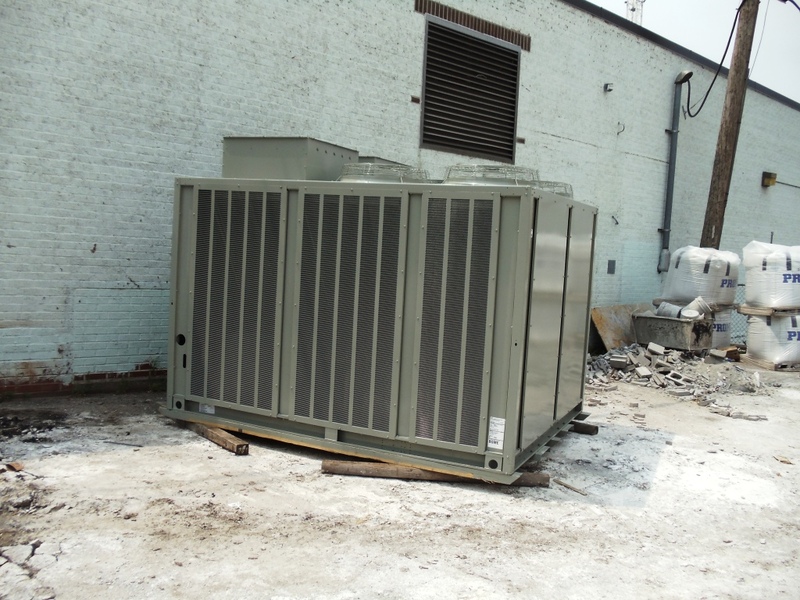 The house will have a new power service this week – which will allow us to fire-up the air conditioner for the first time to cool the property down. 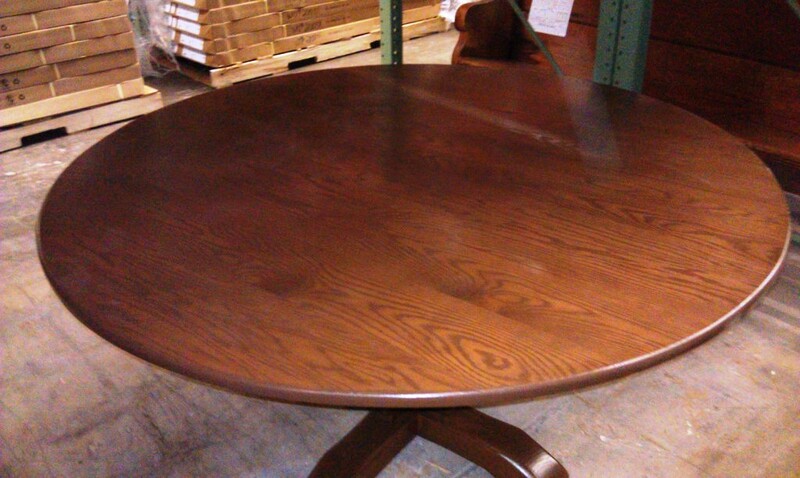 In addition, the first shipment of dorm room furniture has arrived. 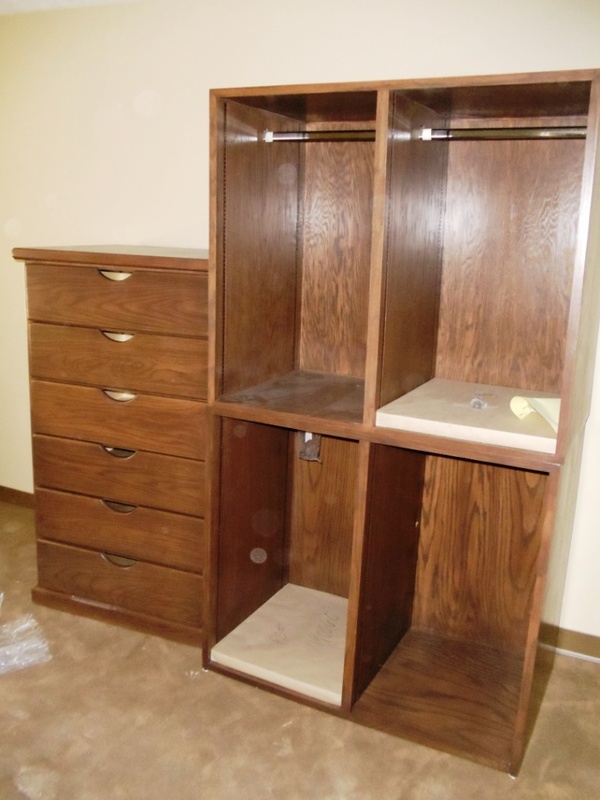 Each sleeping room will have solid oak bunk beds, a dresser and wardrobe. The study rooms will have a desk. Living room furniture was ordered this week and will arrive August 16. 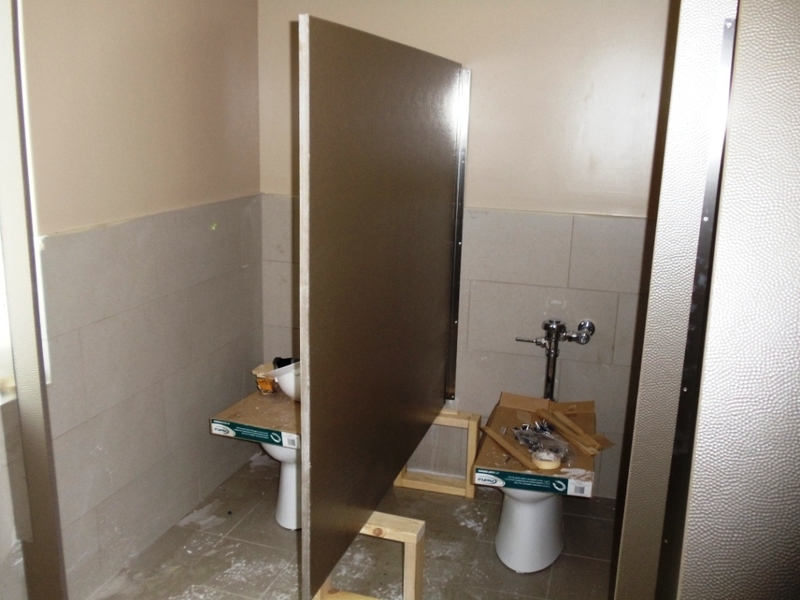 Stall dividers being installed in the 2nd floor bathroom of the 1931 building. 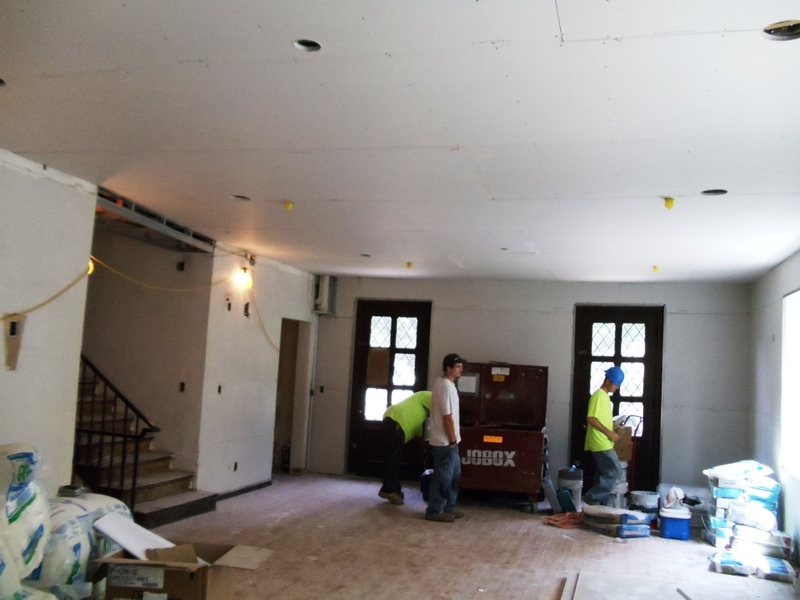 Drywall is up in the 1964 addition — this is the study area for 308 (formerly rooms 308 and 309). 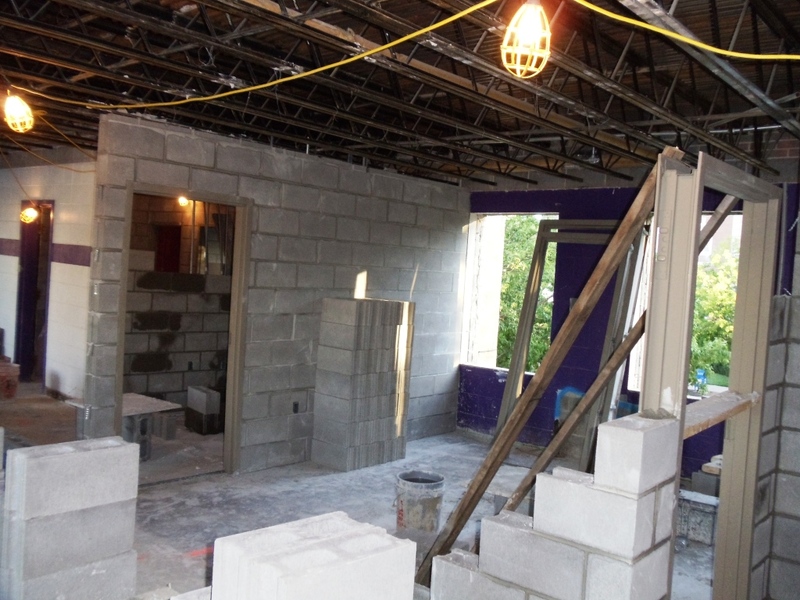 2nd floor bathroom in the 1964 addition — tile work will begin next week. 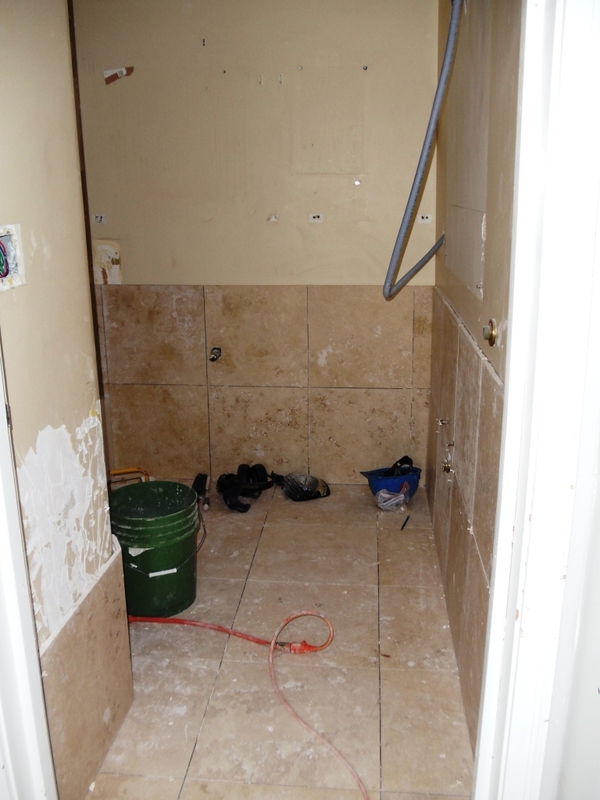 Tile work in the housemother’s bathroom — new floor and fixtures are being installed. Is FIJI building a pool? Passersby on R Street may be wondering what FIJI is doing with all the digging? Is it a pool? Nope. Is it a ditch? Nope. Is it a moat? Nope (but I wish). 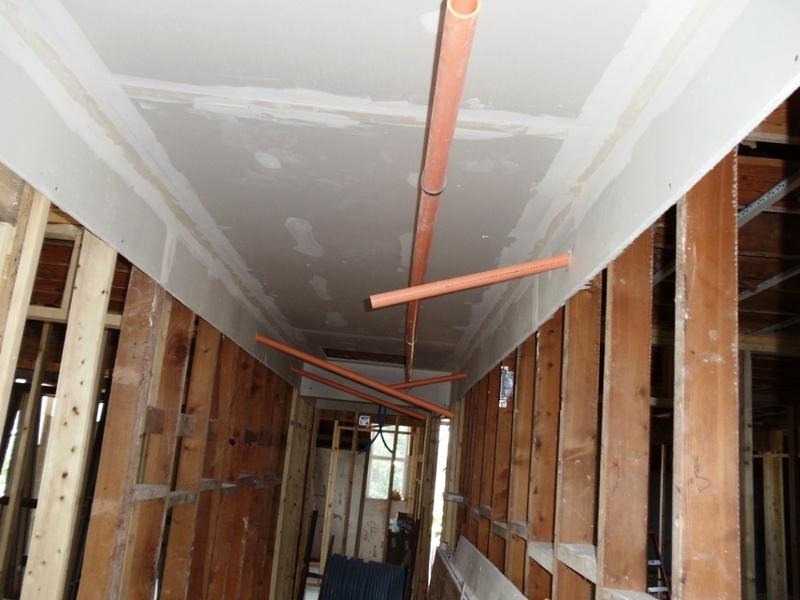 It’s the primary reason this entire project started – fire sprinklers. 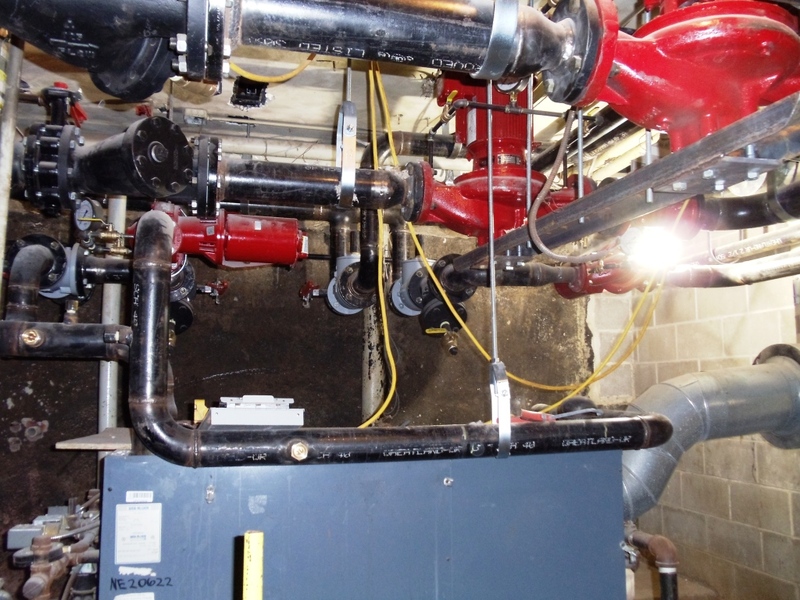 A dedicated water source is required for fire sprinklers and was installed this week. 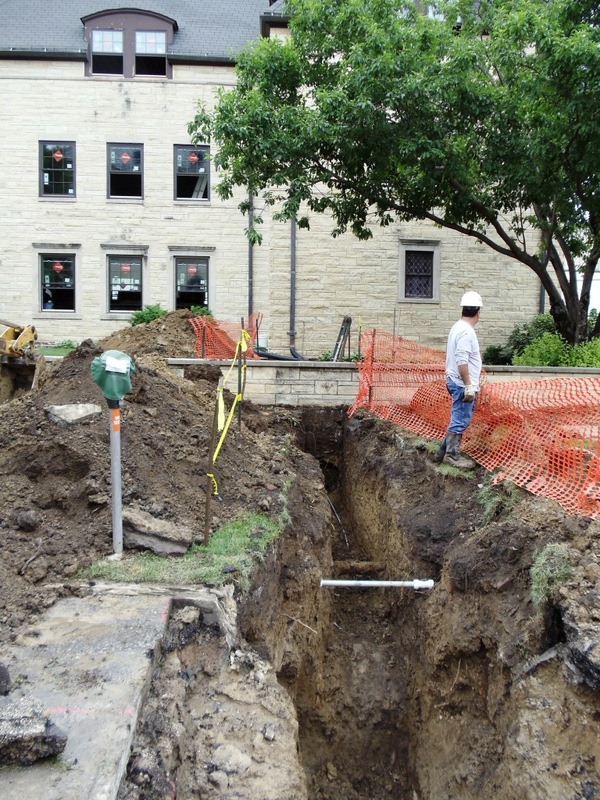 The fire sprinkler equipment will be located in the old bomb shelter. The 1931 side of the house is nearing completion. 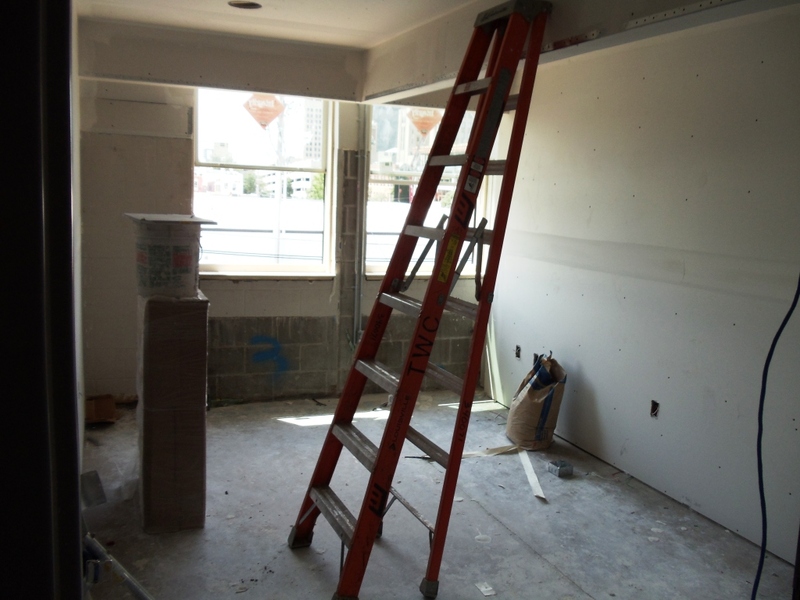 The drywall crews moved to first floor and basement this week and painters have been to work on 2nd, 3rd and 4th floors. The tile crew has finished the ‘old’ bathrooms. The side of the house should be finished in the next few weeks. The 1964 ‘new’ side – that’s another story. 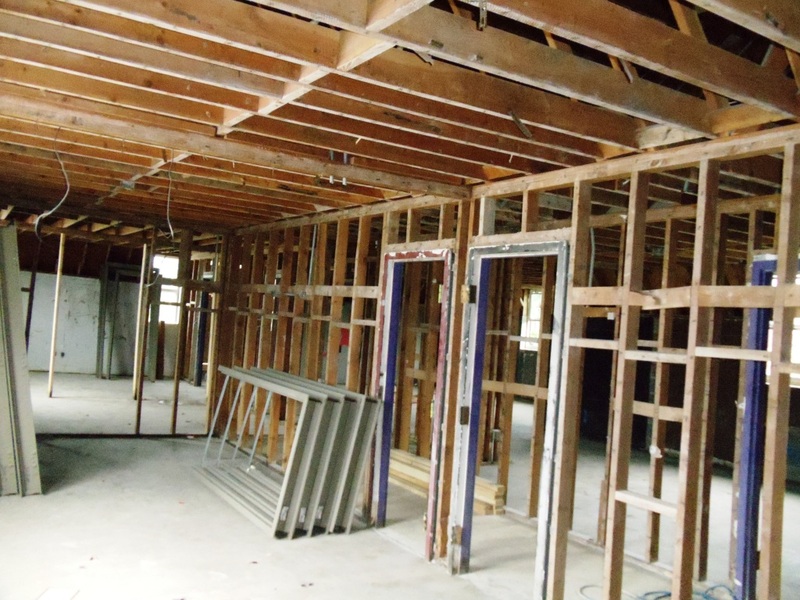 Third floor framing is currently on hold while the architect and structural engineer address existing structural concerns based on the original construction. Next week ceilings will be installed on 2nd floor, new electrical service is being brought into the building and hopefully, the 3rd new framing will begin. 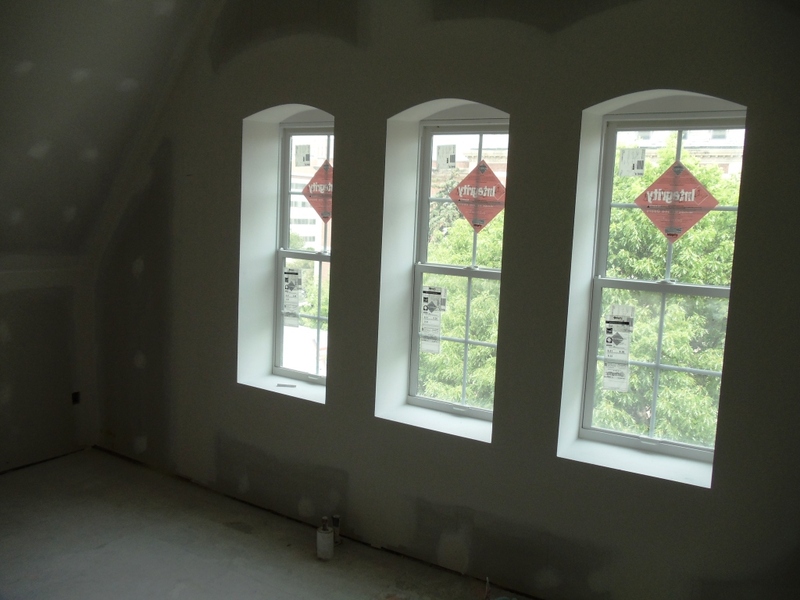 New windows have been installed in the 1964 addition. Ceiling is up in the basement. Fire code required the old exposed beams to be covered. 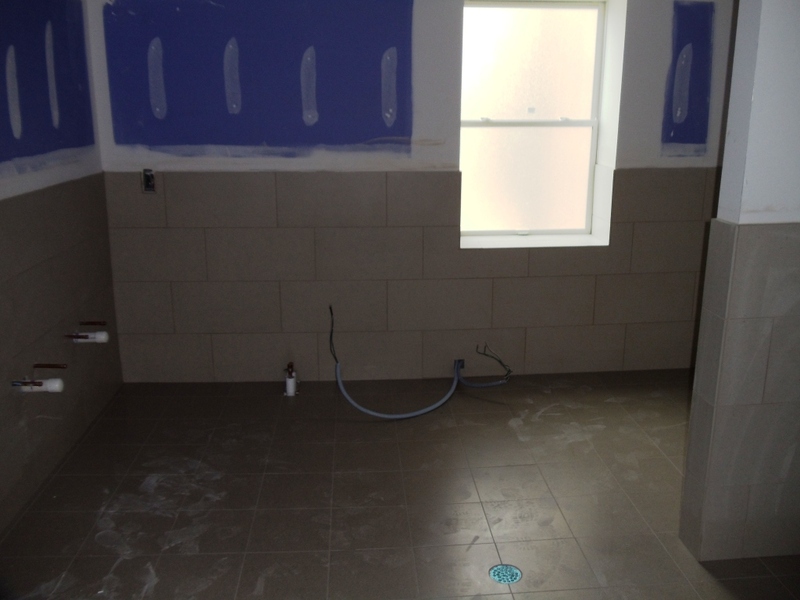 2nd ‘old’ bathroom — tile work is complete. 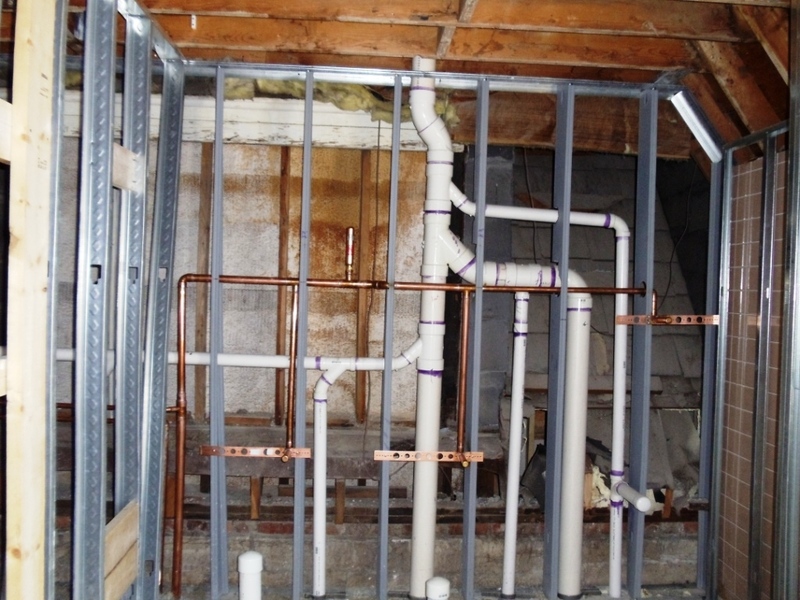 The entire house has new plumbing — this is take in the house mother’s living room — looking up to the plumbing for the 2nd old bathroom. 1931 building hallways have been painted. 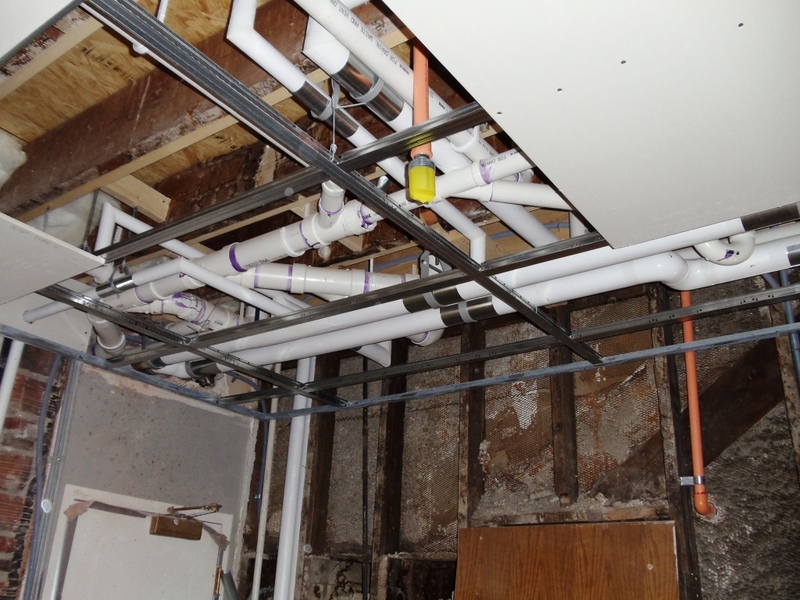 Plumbing rough-ins have started on the 1964 addition — this is taken in the 2nd new bathroom — looking at the west wall (where the trash can use to sit). This will now be where the sinks are located. 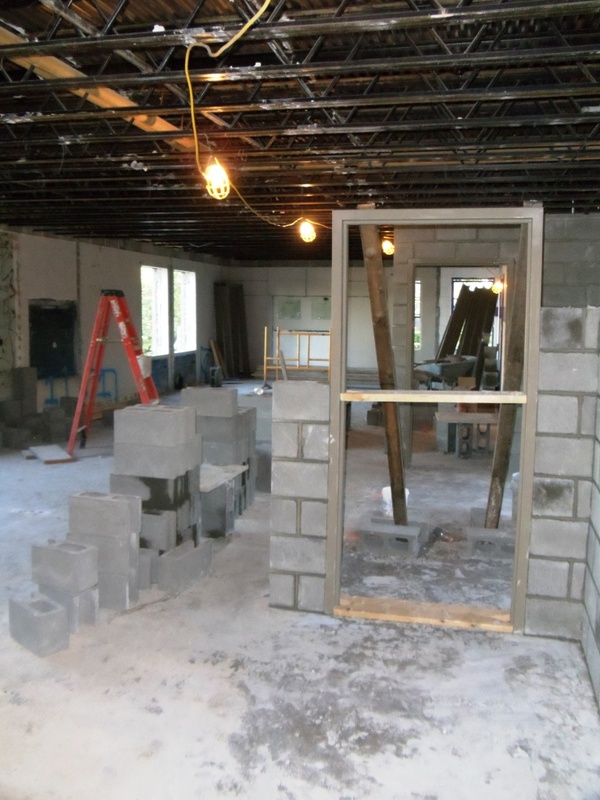 Walls going up in what was room 212 – will be 210. As quickly as the walls in the 1964 addition came down, they are now going back up. Once again, cinder block is being used on 2nd floor and hopefully 3rd. 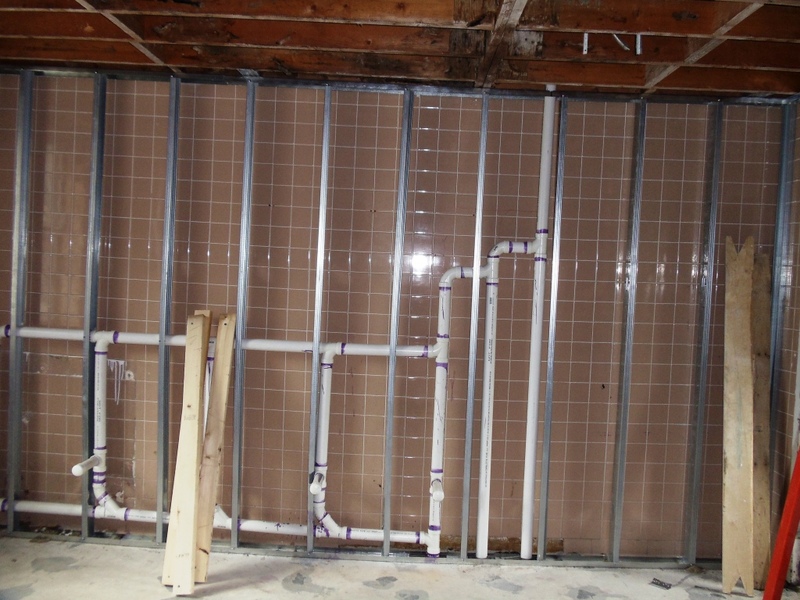 While more expensive to install, the lifetime maintenance of cinder block is significantly less than drywall. 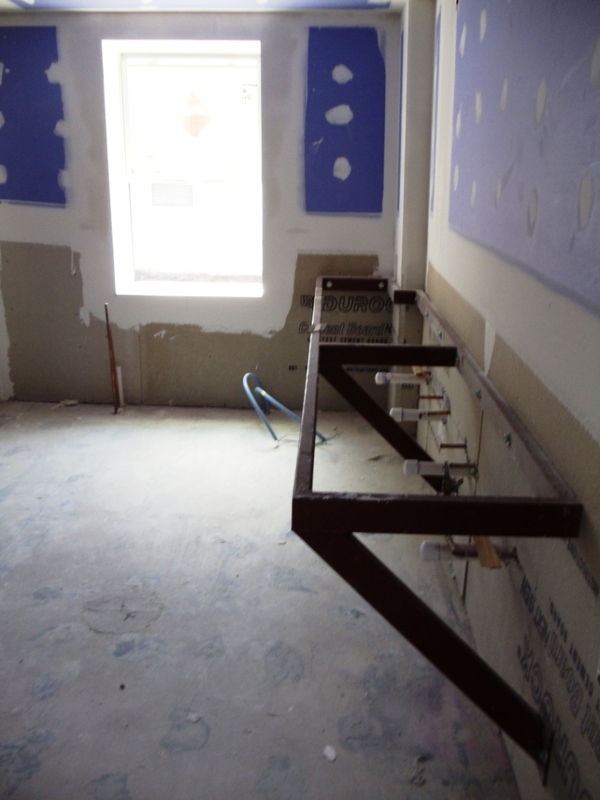 Because the 3rd floor was built with wood studs and plaster, our engineer wants to make sure the floor can hold cinder blocks before they are installed. We will know this early next week. 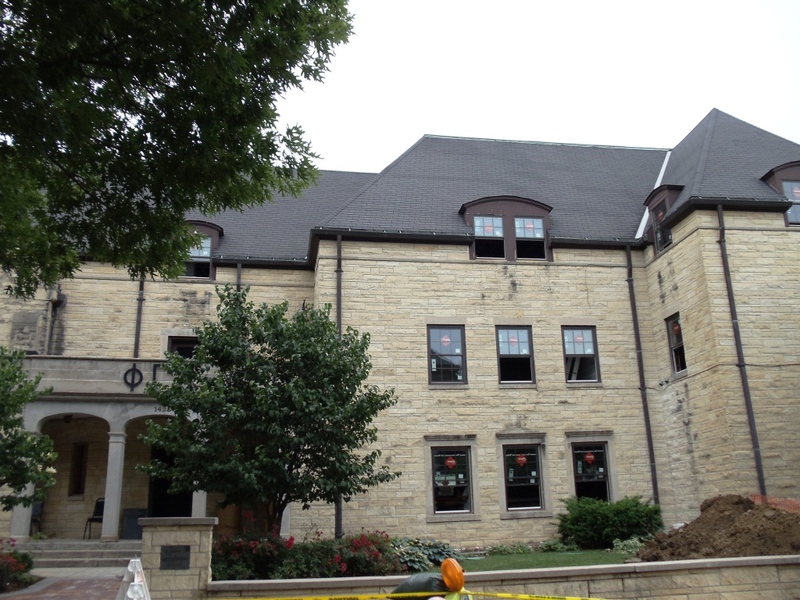 As of the end of this week, there will no longer be any asbestos in the building. 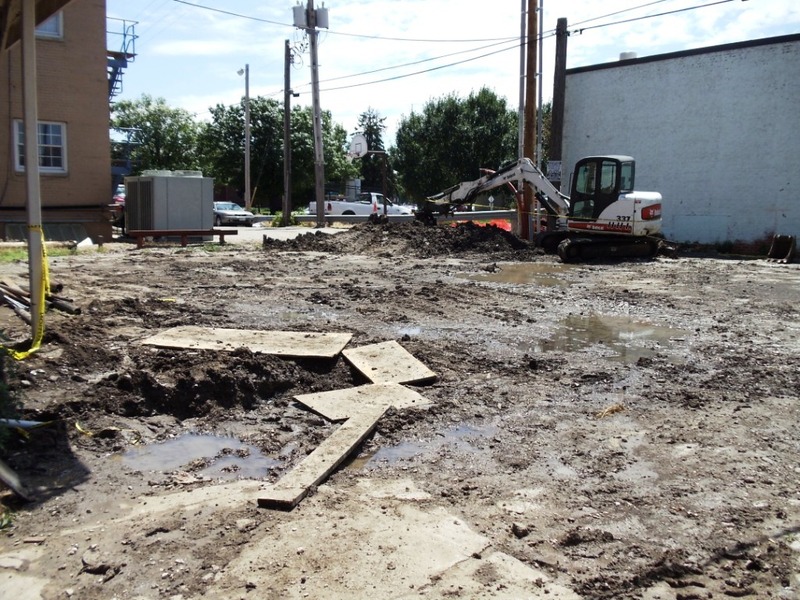 While the Board knew the building contained asbestos when the project started, its extent was not known. 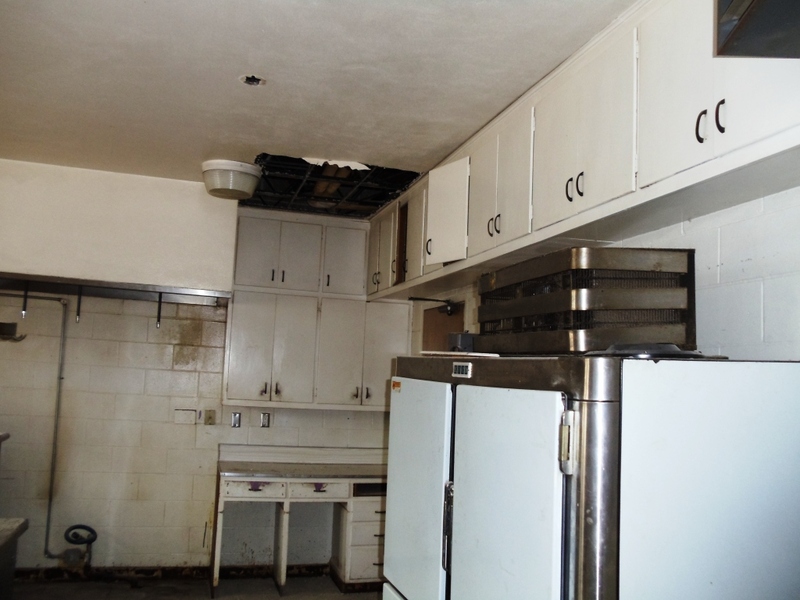 The asbestos removal is significantly over budget, by $30,000. 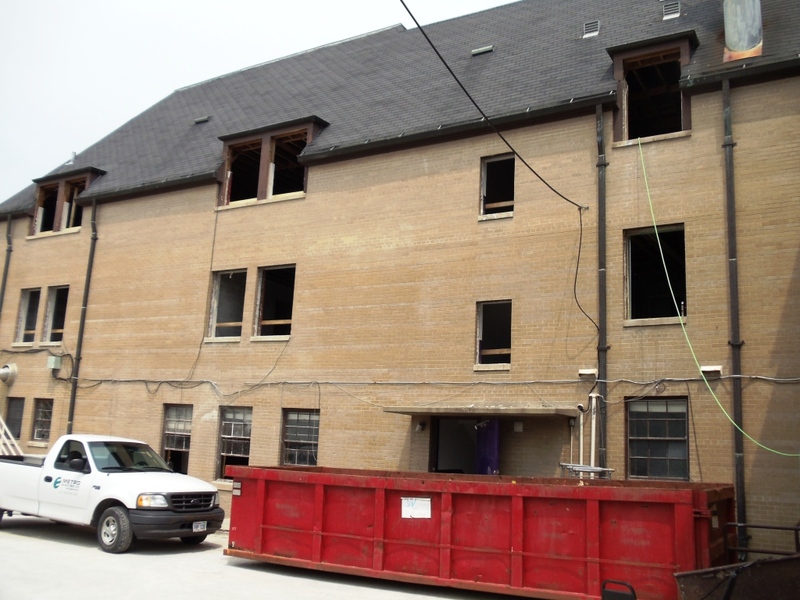 Drywall crews are working on the 1931 side of the building and should finish up in the near future. 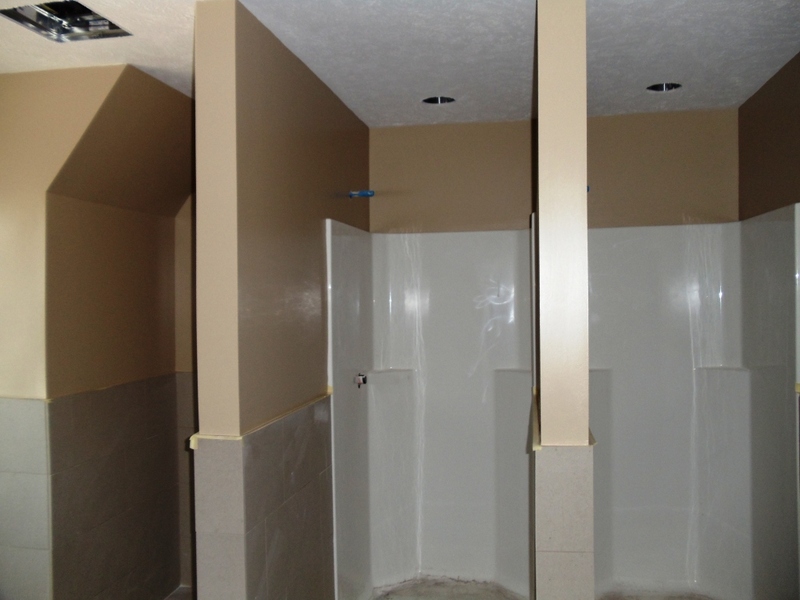 The tile installation crews will start next week in the 2nd and 3rd old bathrooms. The finishes have been selected. 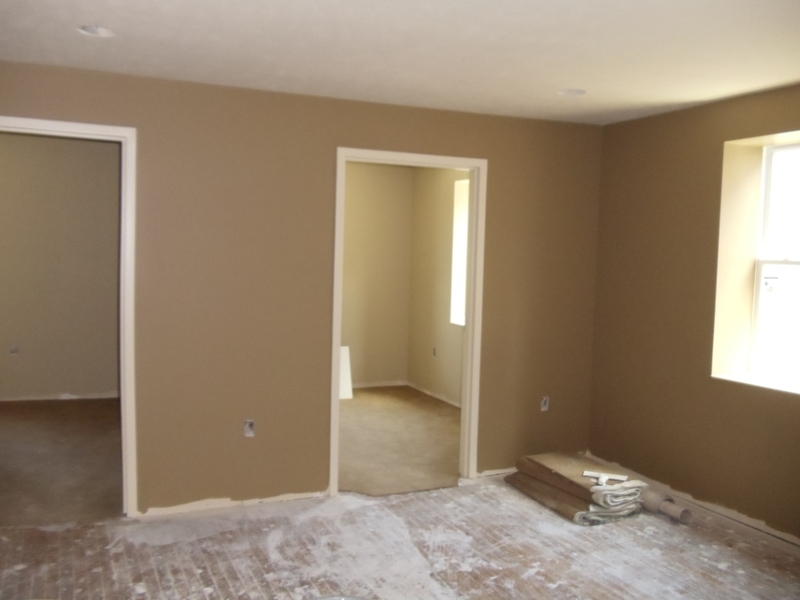 Walls will be painted a shade of beige, carpets are shades of browns, bathrooms will be tiled in shades of grey and beige, and new solid core wood doors will be installed. PLEASE NOTE: the photograph’s DO NOT capture the correct colors. They are posted so you can see the general look. As an overall package, the colors, textures, tiles and other finishes are stunning. A special thank you, again, to Jerry Solomon (Nebraska 1951) for his help in identifying photographs of Lambda Nu’s Innocents and athletes. 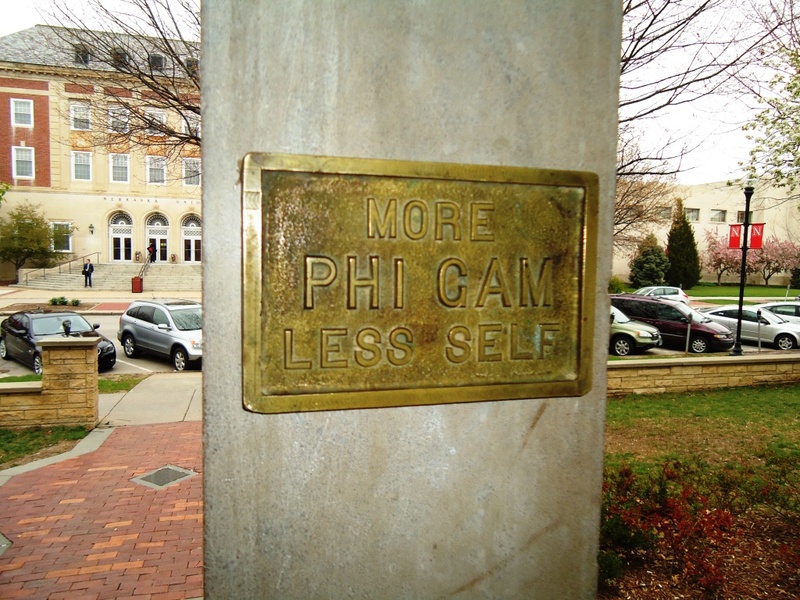 There are still a handful of unknown graduate Brother photos – please take a look and post a comment if you know the identity of the Brother. The House Corporation is still collecting composites. Email the House Corporation if you have copies of composites not included in this collection. 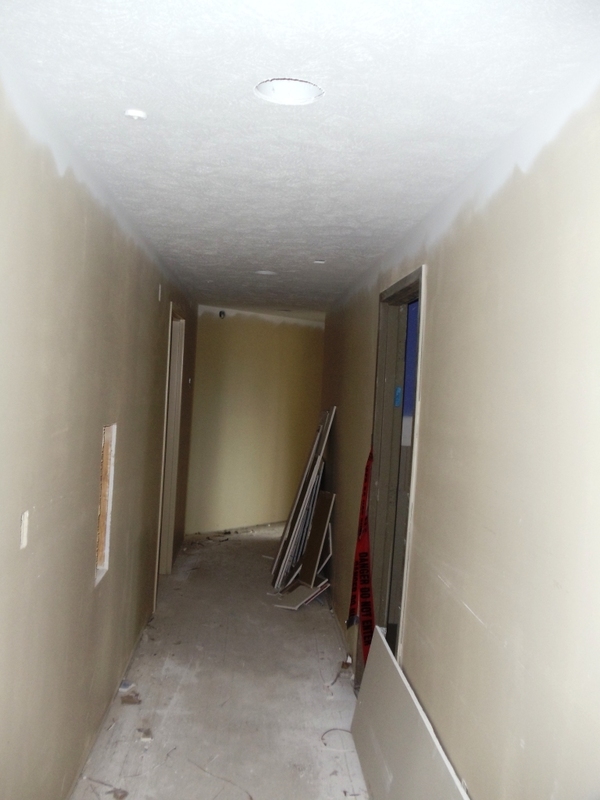 Entrance into the new room 210 (approximate location of the old room 212). This was taken standing by where the supply closet was located. 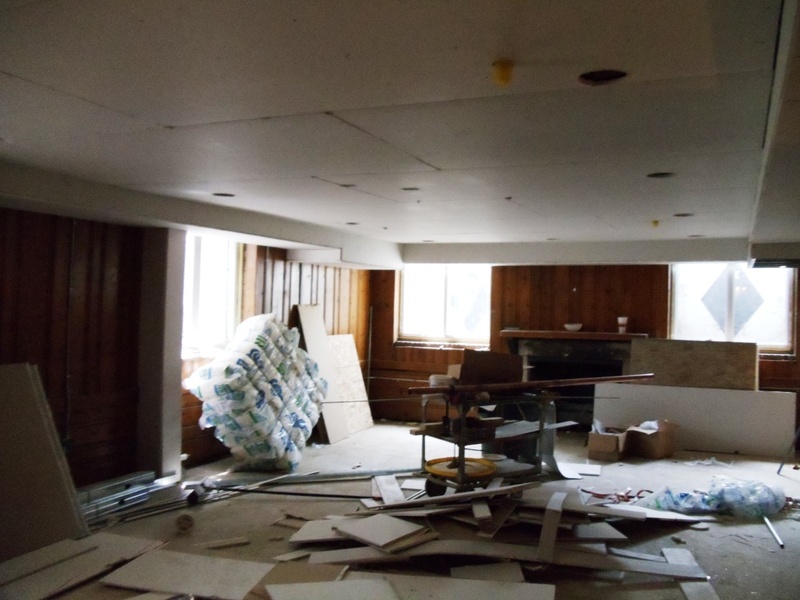 2nd floor — taken in the southwest corner (was room 209). 2nd new bathroom has been stripped. 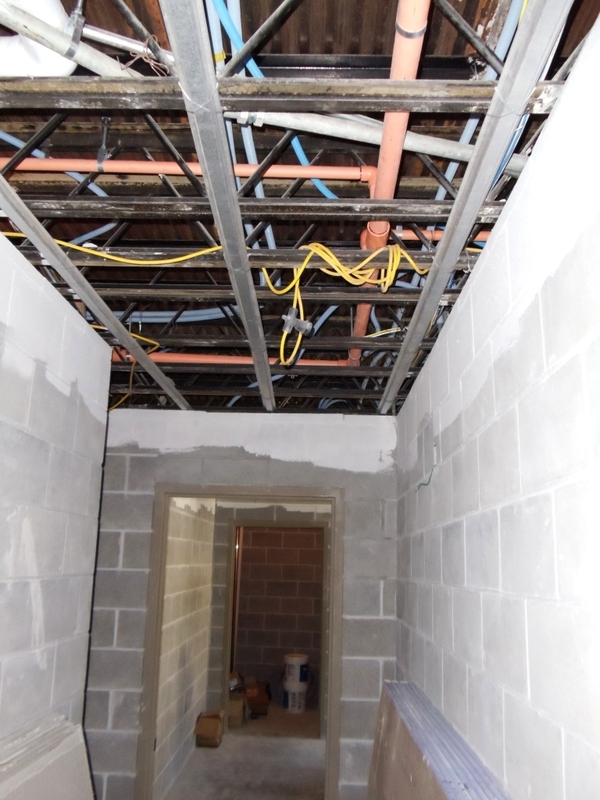 The old cast iron waste stacks have been taken down and will be replaced to accommodate a new floor layout. 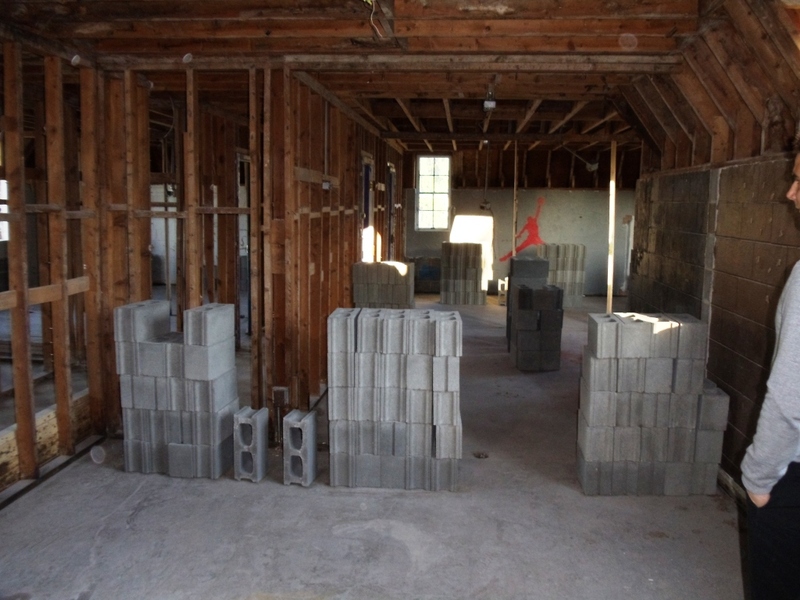 Cinder blocks awaiting approval to be installed on 3rd floor (room 312). 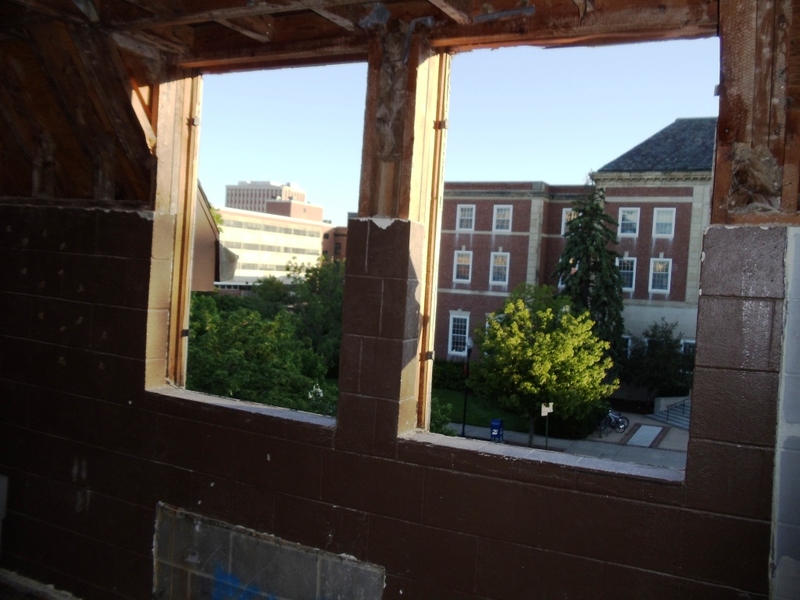 The windows on 2nd and 3rd floor of the 1964 building have been removed. New windows will be installed in the next few weeks. What’s left on the 3rd new bathroom. If you look carefully, you can see the remains of an old window on the east wall. Educational area of room 300. 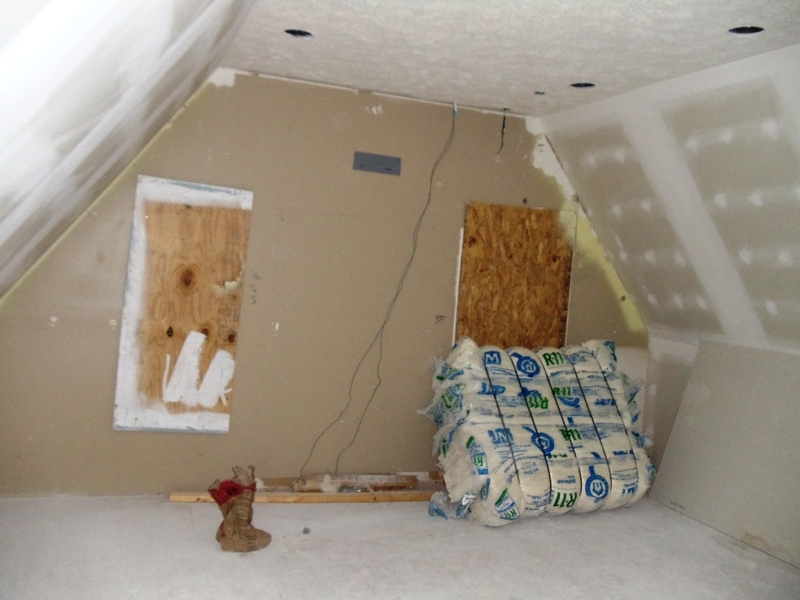 Drywall is up and the mudding is underway. Sleeping room 300a — located on the north side of the 1931 building. This will sleep three men. 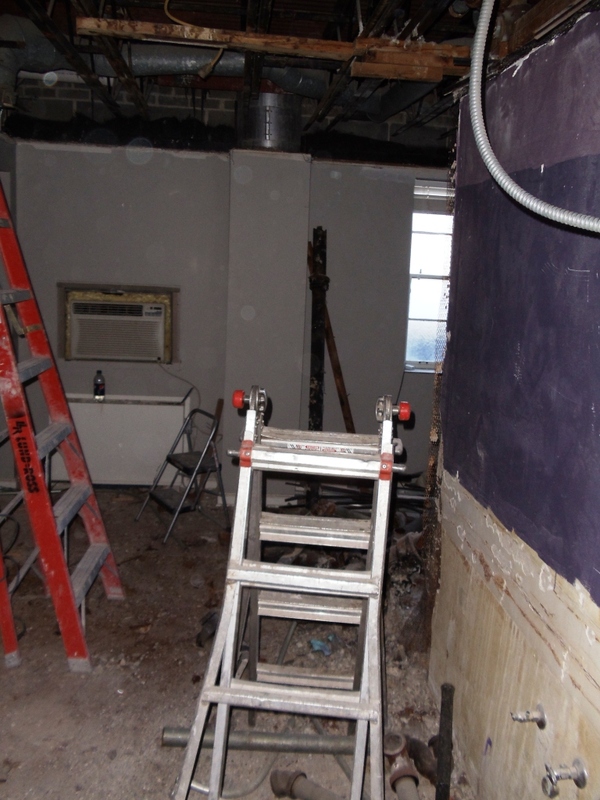 The women’s restroom on 1st floor has been demoed. The grey wall in the back is part of the housemothers bedroom. The women’s restroom will change to an ADA complaint unisex restroom. 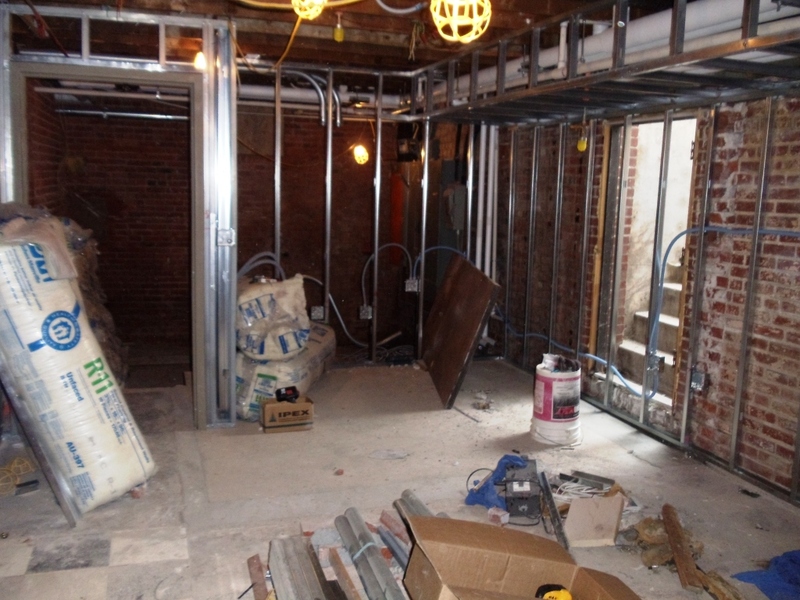 What was the men’s restroom on 1st floor will now house the electrical and computer equipment. Finishes — please note that the following photographs do not do the actual colors justice. 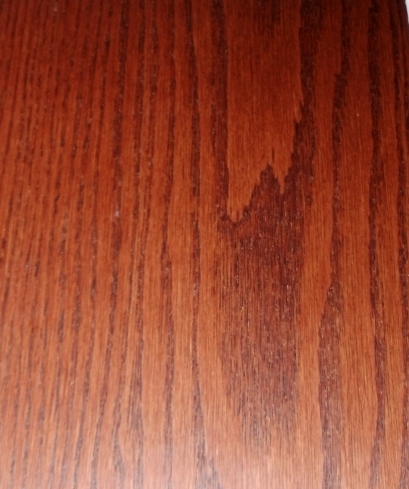 These are posted so you can get a general idea of what the finishes will look like. Paint — the walls are a light beige, metal trim will be painted a light brown and ceiling white. 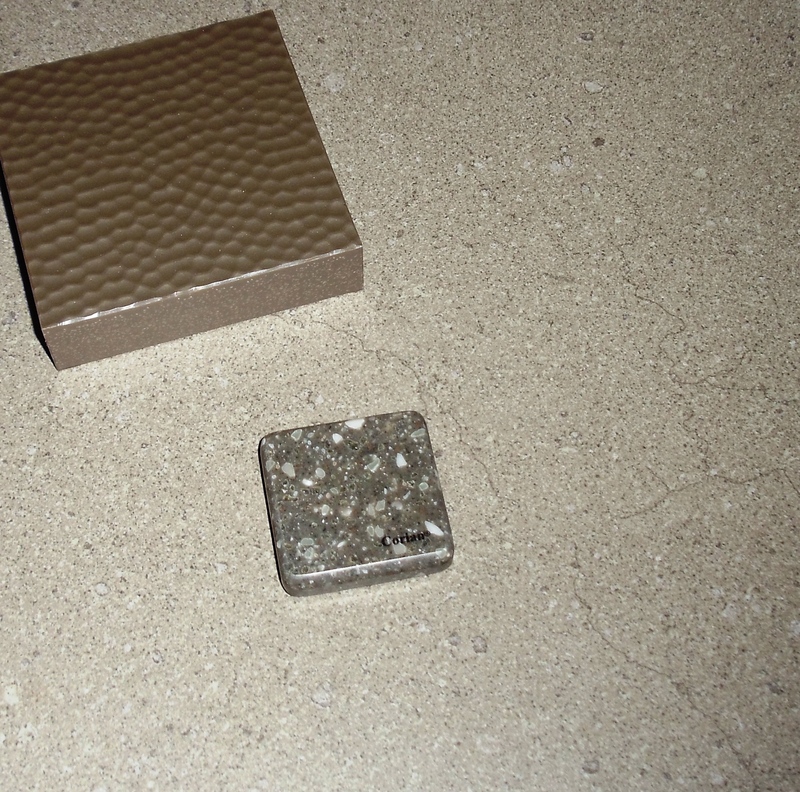 Carpet — sample on the left will be used in the hallways, the grey on the right will be in the study rooms and browns will be in the bedrooms. Doors — new doors will be solid core oak and stained. 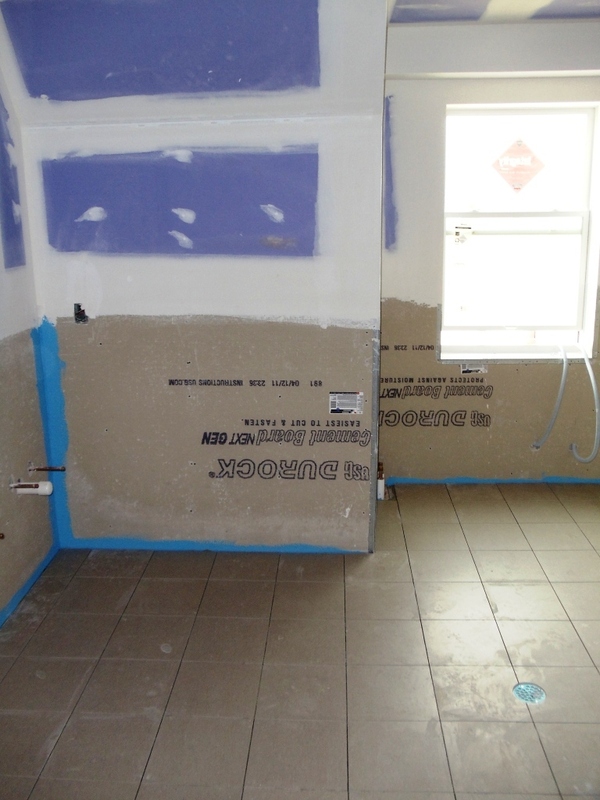 Bathrooms — tiles will be a grey; counters will be the darker piece of grey and the partitions between toilets is the sample at the top of the photo. 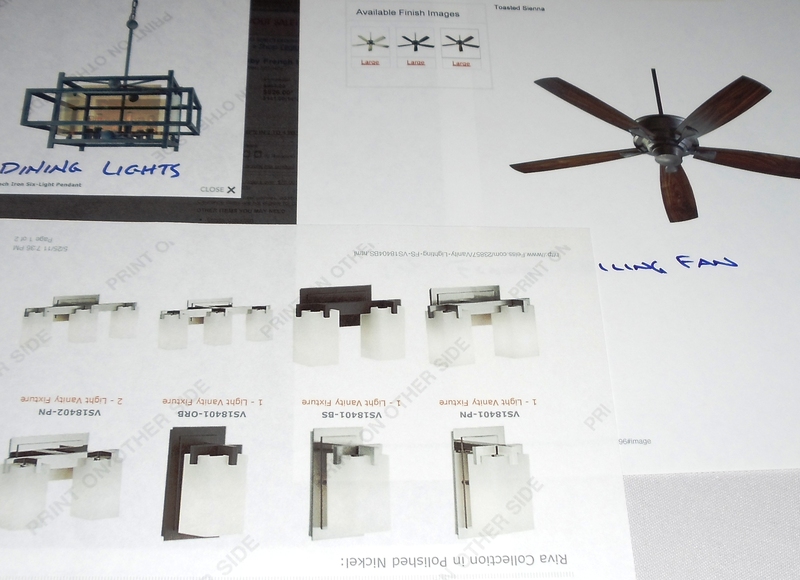 Examples of lighting that may be used in the dining room, living room and bathrooms. 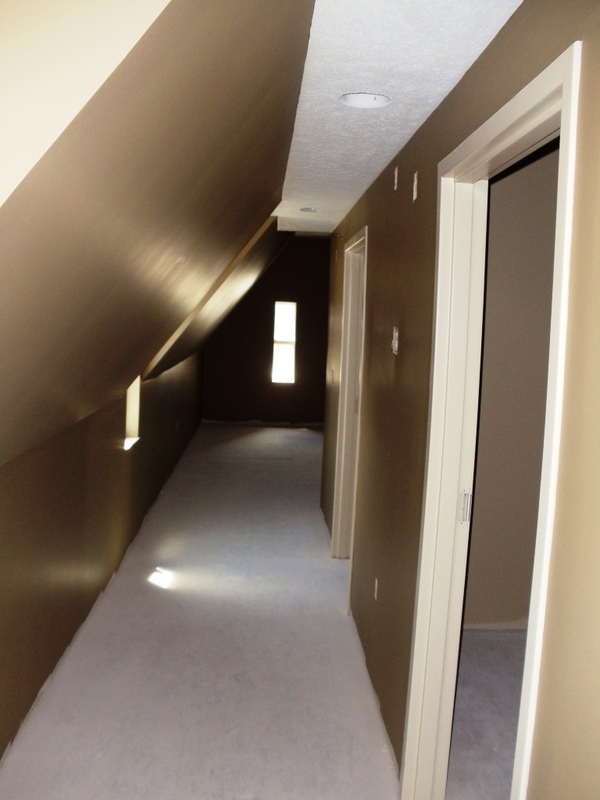 All study rooms, sleeping rooms and hallways will use recessed lighting. Not pictured — the living room’s wood floors will be refurnished.